This post is a suggestion of an easy way to encourage independence in your little ones. For second breakfast today (I have Hobbits, not children) Toby was asking for toast. By asking I mean he was using his new vocabulary to chant at the top of his lungs 'MARMITE TOAST!! MARMITE TOAST!!' which gave me a subtle hint about what he wanted. When time allows, it's always a good idea to take children's requests and turn them into an activity which enriches their experience and gives them a chance to try things out for themselves. In this case the simple (for an adult) task of putting their own spreads on their toast. I do the hot bit of the toaster myself, but you'll know the abilities of your own kids in respect to the hot stuff. Toby is getting quite proficient at spreading, but is playing by nobody's rules when it comes to the order the butter and marmite should go down in. I think it's fine to demonstrate how I'd do it on my own toast, but it's then up to the kids to experiment and do things their own way whenever possible. As parents and teachers it pays to try and step back and not direct every move - being overly concerned in doing things 'the right way' stifles kids creativity and is frustrating and dis-empowering for everyone. Taking it easy when you can means they'll also be more likely to co-operate when you do need (age and development level appropriate) things done in a particular way. Ollie has been doing this for nearly three years. 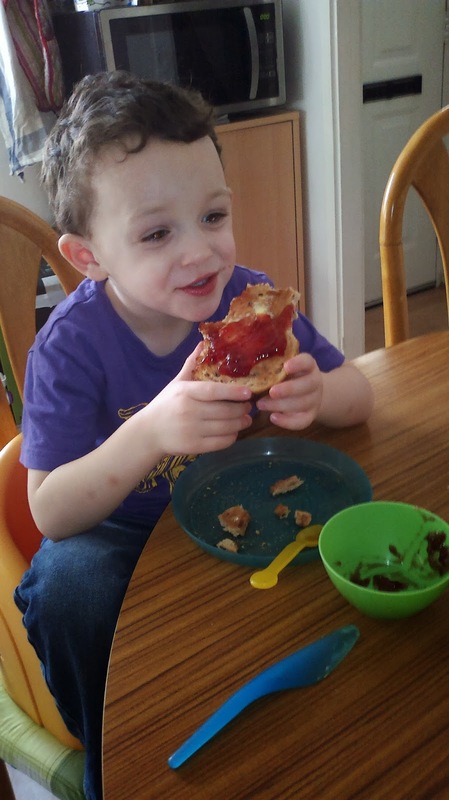 Increasingly he is adopting a 'standard' approach of carefully spreading butter all over his toast and then covering it in jam. 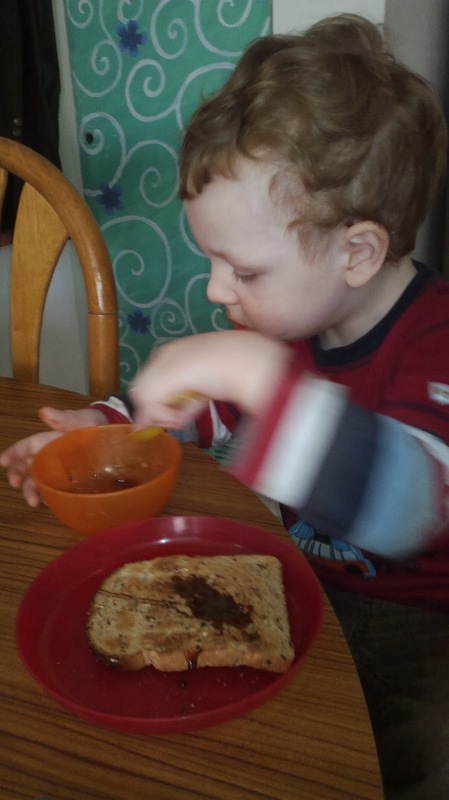 Toby has a go at spreading, then eats the rest of the butter and marmite with a spoon. 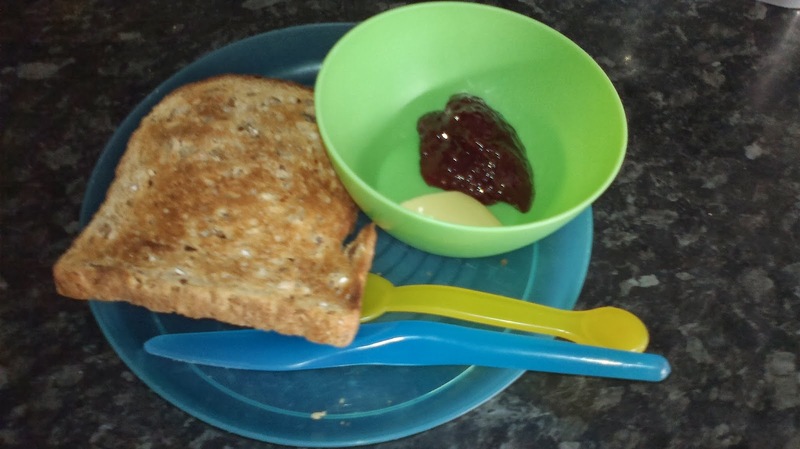 This is all really basic, as with most of the ideas on this blog, and I apologise to everyone saying 'well, duh, of course I get my two year old to practice spreading toast'. However, I worked for years at an outdoor education center and was continually astounded at the number of quite old children (even as old as 12 or more) who had never made a sandwich for themselves, or made their own bed. One 8 year old had never had a bath without adult help and didn't know what to do in the shower so went home quite grubby and smelly. As well as preparing them for adult life, achieving self care and proficiency in household activities for themselves builds self-confidence and turns simple activities into opportunities for creative learning. It's at the heart of a Montessori approach to learning where your role is to facilitate independence and freedom within sensible limits. I don't subscribe wholly to any particular learning philosophy, but there is definitely a lot of good sense in the Montessori ideals. 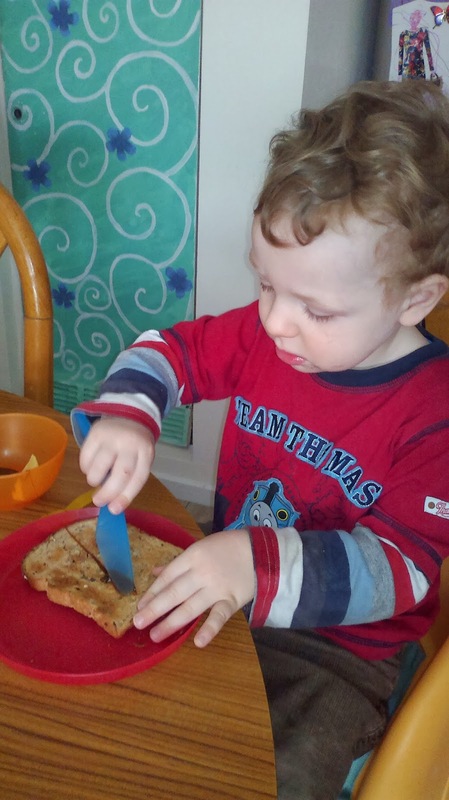 Even this simple task of spreading toast also provides opportunities to hone hand-eye co-ordination and fine motor skills. You could say that encouraging children to achieve independence is the best thing since sliced bread (groan).